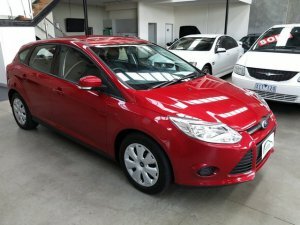 2013 Ford Focus Ambiente PwrShift LW MKII Hatchback "NEW CAR WARRANTY UNTIL FEB 2016" Immaculately presented, Excellent service history, interior is in perfect condition, any inspection will not disappoint! first to see will buy! We are one of Victoria's leading independent car dealerships with over 30 years experience ! Every vehicle we advertise is of high standard with kilometres, condition, vehicle history important to us, please expect a decent vehicle when you come in to visit us.